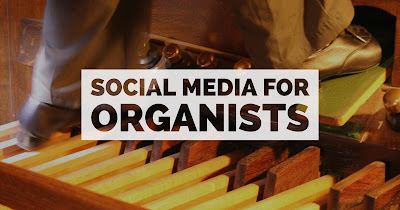 On Tuesday of last week I went to an Omni Hotel ballroom in downtown Richmond, Virginia to talk about Social Media for Organists at a regional convention of the American Guild of Organists. My co-presenter Mary Stutz and I created a handout which you can still access at bit.ly/SocMedOrgan. It's a Google Doc so that it can be continuously accessed by you and updated by us. In my remarks I tried to get at something that concerns me about all this social media stuff: it doesn't last. This is by design. Now there are even "stories" on several platforms that are only available for 24 hours, and then they disappear. Social media is meant to be very much "in the moment", but this kind of brief shelf-life isn't entirely worth our valuable time, I would argue. Besides, organists tend to like stuff that lasts. We play a lot of music from the eighteenth century, and some of us have had the good fortune to play organs that are older than that. So here is my advice to organists (and others) for a digital life that has some longevity and lasting value. Your footprint on the web should be permanent, and it should be as accessible as possible. If the goal is, in fact, to be social, you don't want a "login barrier" between you and your potential audience. Content on Facebook and Twitter are not easily indexed by Google; public web pages are. If you want others to find your content, tomorrow, next week, next year, make sure that you post it to a blog (or another website) first. Then use your social media channels to point to that content. You can always send out a new Facebook post pointing back to an essay that you wrote a year ago. Jonathan Aigner of the popular Ponder Anew blog is really good at this. His articles repeatedly spike in popularity as they make the rounds and go "viral" time and time again, sometimes years after the initial post. Tangent: I couldn't help but notice that Aigner's latest post is about how the new anthem from First Baptist Church, Dallas, "Make America Great Again" is now licensed by CCLI, further proof that that organization is concerned with copyright but not Christianity. But I digress. Don't keep your social media presence a secret! If you use various social media channels, especially as an organization, make them visible on your website. There's a famous English choir that does this well. King's College Cambridge embeds their Facebook page on their choir website, and their music list Twitter feed on their music list page (see links in the bit.ly/SocMedOrgan handout). Two personal examples: 1) when I first signed up for Twitter in 2006, I thought that its key value would be embedding it on my website so that there would be something current (and timestamped) right there on my home page. Twitter and I have changed a lot in the interim, but I still keep Twitter embedded on this blog. 2) For the past two years or so I've been using SoundCloud to upload audio recordings from St. Peter's, St. Louis. I want to widen the audience beyond SoundCloud users, so we have embedded a SoundCloud widget on the church's music page along with our Twitter timeline. How do you do this? Each particular social media service will provide you with a block of code that you can cut and paste into your website. It's that easy. For example, here's the info on how to embed a Twitter timeline. My favorite social media service is Buffer. If you don't know about it, check it out. It's especially useful for managing multiple accounts. Buffer allows you to distribute posts over specific times that you schedule. You can place general posts in your "buffer, " and each one can be sent out sequentially, or you can schedule specific posts to be sent at specific times. I think I probably use both features about equally. If I find an interesting news story or blog post that I want to share on my own Facebook page and/or Twitter account, I'll put it in my buffer, and it will be sent out in the order that it was added. I suggested that organists could even use the scheduling feature to "narrate" their organ playing during a service or recital on Twitter. In fact, I was tweeting about every five minutes during my presentation Tuesday morning through the magic of Buffer. Another nifty service (which you just need to check out so I don't have to try to explain it) is IFTTT (If this, then that). Finally, don't overlook basic integration features offered by various social media channels. If you upload a file to SoundCloud, for example, take advantage of the option to share that new upload automatically on Facebook and Twitter. I think that automation is probably the tool that a lot of organists need to get into social media a bit more. They might think "I don't have time to Tweet every day." That's fine, but if you work for a congregation, you're probably used to a particular weekly "product", so why not start with one tweet a week? And why not load all of those weekly Tweets into Buffer at one sitting and then forget about it for a while? This is a great way to get started. But a word of caution: if you only automate, and then utterly neglect your social media channels it's much more "media" than "social media". Check in occasionally and be friendly. Thank people for engaging with your content. Share other content that you find interesting. Do you have to check your Twitter account every minute? No. But is it nice to make new connections online? Yes. Be authentic. Use your own voice. And don't assume that the social media landscape is fixed. New innovations to existing services are rolling out all the time. And live video, while not exactly new, has all kinds of potential for musicians. New services will probably roll out immediately after you finish reading this. Try them! Sign up! Explore! Be creative. You might be the first to discover a really neat application for a new service. I'd love to hear what you are doing with social media. You can comment on this blog post below (I'm using Blogger, by the way). Or if you got here from Facebook or Twitter, you can find me there too. What did I miss? 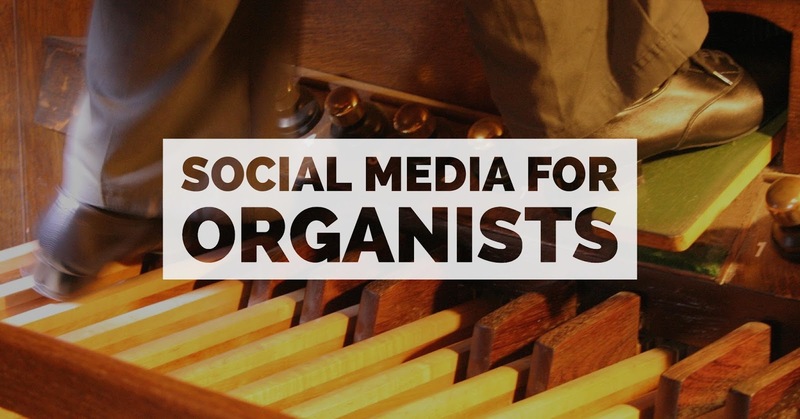 What other ways can organists be using social media to be awesome on the web?